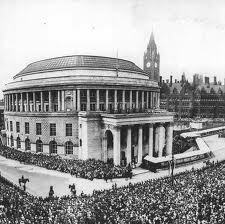 Queen Elizabeth II is not the first monarch to visit Manchester. A glance at the Town Hall Murals might suggest it was Philippa of Hainault (as featured in the fourth panel), in which she supposedly arrives in a Manchester luscious with May sunshine to inspect the work of the local cloth merchants, but her visit is apocryphal. A century later in November 1745, James’s great-great grandson, Charles Edward Stuart, (better known as Bonnie Prince Charlie), dropped into the church with his ragtail army to say prayers en route to London where they would attempt to seize back the throne for the deposed Stuart line. His grandfather, James II, had been forced out in 1688 for being a Catholic and the throne was now in the hands of distant cousins from Hanover. Protestants, whose head paterfamilias were mostly called George. The Bonnie Prince, born in Rome, and who died in Rome, but is usually cited as Scottish, never made it to the capital. His army turned back at Derby, later returned to the Manchester church for more spiritual sustenance, and were eventually vanquished at Culloden. The most unlikely of royal visitors to the Cathedral has to be Edward VIII. He was on the throne for less than a year and therefore largely unable to fill the country with mementos. A rare reminder of his short reign is the army banner for the Grenadier Guards which he hoisted in July 1936 above the Cathedral’s north door. Edward, or to be more accurate, David (his real name), had served with the regiment during the Great War but was not allowed to fight due to being heir to the throne. Queen Victoria appeared in Manchester on several occasions, and was the first royal to make a habit of touring the country performing public deeds. In 1851 a Guard of Honour of the Yeoman Cavalry accompanied her royal party as far as Cross Lane, the boundary between Pendleton and Salford. There they were dismissed for fear of disturbances, political commentators believe, for the Peterloo Massacre was still fresh in people’s minds. The Queen was received in Manchester not at the Town Hall on King Street but in the Cotton Exchange which from then on became the Royal Exchange. 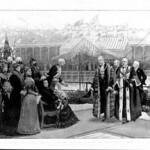 The Queen and Albert returned six years later for the Great Art Treasures Exhibition held at Old Trafford, but the Queen was not here in 1877 to open Manchester Town Hall, despite being invited to do so. We have no idea if the subject of Victoria’s refusal occupied the conversation of the current Queen and her Manchester chaperones this time around, but what an interesting discussion it would have made. Sir Richard Leese might have explained to her Majesty that the Queen stayed away for fear of appearing on the same platform as Abel Heywood, the then Mayor. Heywood had been a fiery revolutionary in his youth, jailed for failing to pay stamp duty on his newspaper, the Poor Man’s Guardian, which occasionally spouted republican views. And if that wasn’t bad enough, Heywood’s wife, Elizabeth, had commissioned a huge statue of Oliver Cromwell – yes, Cromwell, the regicide; Cromwell, the man who had ordered the execution of Charles I – a statue that had originally been placed in Manchester at the end of … Victoria Street … but now rests in Wythenshawe Park. 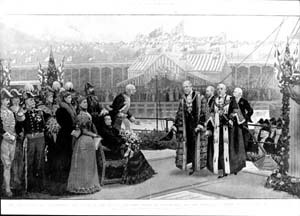 In 1894 Queen Victoria returned to the city to open the Manchester Ship Canal. Since then each ruling monarch has appeared in Manchester on several occasions, though none experienced so embarrassing an incident as George V who opened the Central Reference Library in 1934. The King had to wait outside while the official inside fumbled to find the key. Since then royal visitors have cut ribbons instead of waiting to find someone who can open a door. • We will be running our Royal Manchester walk in the run-up to the Diamond Jubilee bank holidays at 12 noon on Thu 24 May, meeting at the Visitor Centre. We will also be running a Diamond Jubilee canal cruise on Tue 5 June at 11.30am, bookable only through Quaytickets.